By Jeremy Soule. Arranged by Chrissy Ricker. Sheet Music Single. 4 pages. Published by Chrissy Ricker (H0.547798-SC001319870). 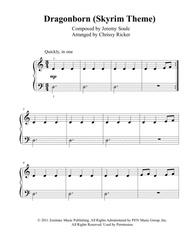 This is a "big note" (level 1-2 of most method books) piano arrangement of "Dragonborn," the main theme from "The Elder Scrolls V: Skyrim." Need a more challenging arrangement? 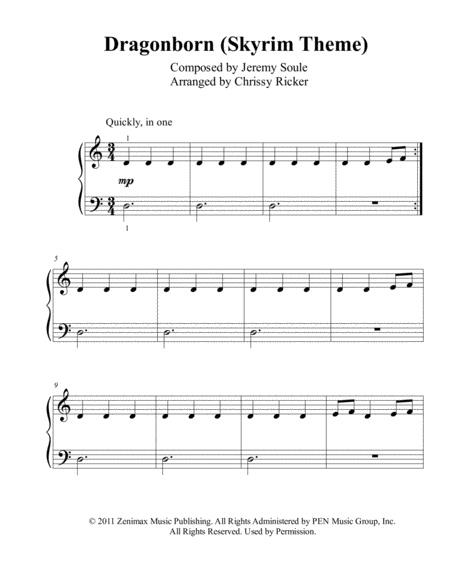 Check out my "easy piano" version of this piece for levels 3-4.